iPhone-using football fans rejoice! 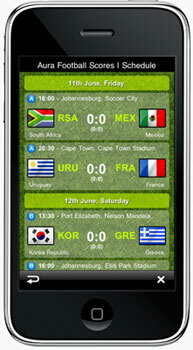 Sygic have released an update to Aura on the iPhone that allows live scores and fixtures to be viewed within the app. They have also made some changes to route calculation allowing users to navigate from a point where there is no road nearby. Post Code search and Weather have had a small facelift too. To get to the football scores go to Menu, Info and then Football Scores. Future updates have also been announced and these will include via points, avoid road blocks and full multi-stop route planning (from the comfort of your own home). Facebook and Twitter integration are also going to be improved as well as the app making use of the iPhone's native keyboard - particular bug-bear of mine in all the versions of Sygic (iPhone, Android and WinMob).